Carrots were never one of my favorites growing up. What!, is the reaction that statement has garnered from most people. They have a natural sweetness; don't kids like that? Maybe. My aversion could also have something to do with the time I ate an entire bag of baby carrots before my first eye doctor appointment, because I heard they could help your vision. I really, really didn't want glasses. Too bad for me, though, because I DID get glasses. And a stomachache. Anyway: I DO like carrots now. Very much, in fact. One of the only vegetables out there that doesn't lose much (if any!) nutritional value through cooking, I like them raw, shredded, roasted, etc. 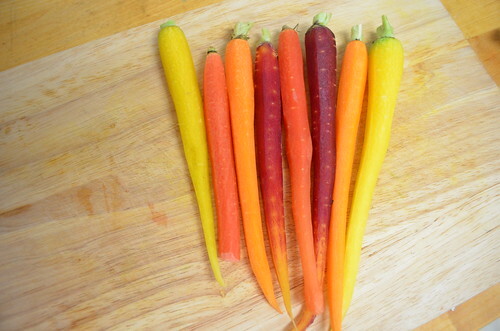 So imagine my happiness to discover that carrots come in many vibrant shades other than the orange hue we all know so well. Yellows, reds, purples. Some of which are even a different shade one you peel them, and then yet another shade when you chop them. It's true. I once went from purple to orange to yellow during this very process. Magic! So of course, all I wanted to do with these beauties was prepare them in some way that would preserve their color. Other than eating them raw. Blanching is the perfect way to keep or even enhance a vegetable's vibrancy. It's a quick-cook method that keeps your meal looking colorful. Preheat your oven to 350 degrees. 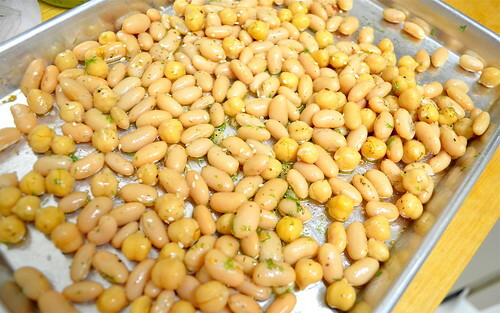 Evenly spread about 8 ounces of cooked cannelli beans (I also tossed in a few chickpeas) over a small roasting pan. I kept the seasoning simple: a healthy dose of olive oil, squeeze of lemon juice, salt, pepper, some white sesame seeds, and some chopped fresh dill. Toss to coat evenly, then roast for about 20-25 minutes, rotating once halfway through. With your beans in the oven, prepare an ice bath (which is exactly what it sounds like: some cold water and some ice) in a medium-sized bowl. The ice is the second step in the blanching process; quickly bringing your vegetables from boiling water to ice water shocks your vegetables into stopping the cooking process. Bring some water to a boil in a small saucepan. Once it's at a steady boil, toss in your chopped carrots (I cut them on the thicker side) for about 1-2 minutes. 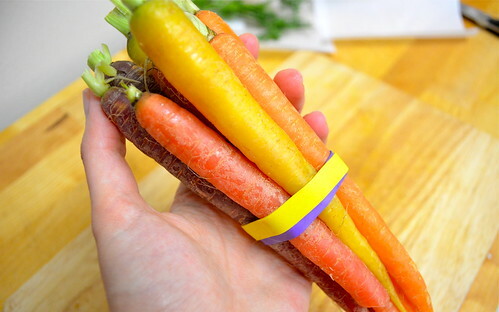 Use a strainer or a slotted spoon to scoop up your carrots and place them into the ice bath. Let them chill for about 30 seconds to 1 minute. They should still look beautiful and bright! 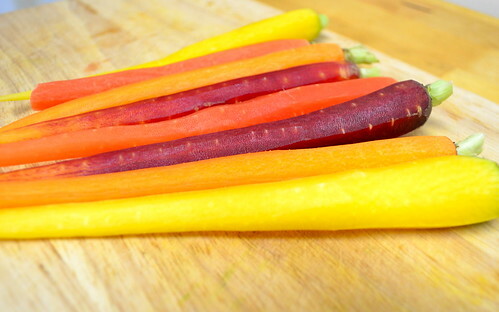 While you wait for your beans to come out of the oven, just leave your cooked carrots in a strainer or a bowl. This small side dish is just right when it's slightly warm or even room temperature. 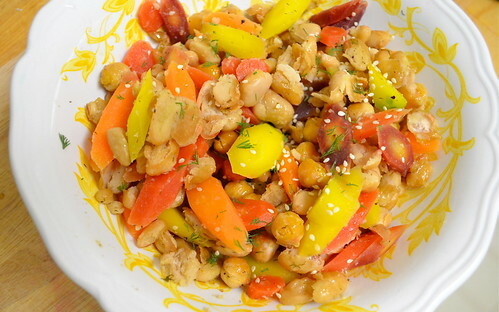 When your beans come out of the oven, toss them together with your carrots. Drizzle with a little more olive oil and garnish with another sprinkle of sesame seeds and more fresh dill.